Jamalabad Fort is an old hilltop fortification almost 8km north of Belthangady and 70km from the coastal city of Mangalore in the state of Karnataka, India. The place is under the shadow of an enormous rocky outcrop which towers above everything else around it. Well, let’s have some technical details of the fort, shall we? 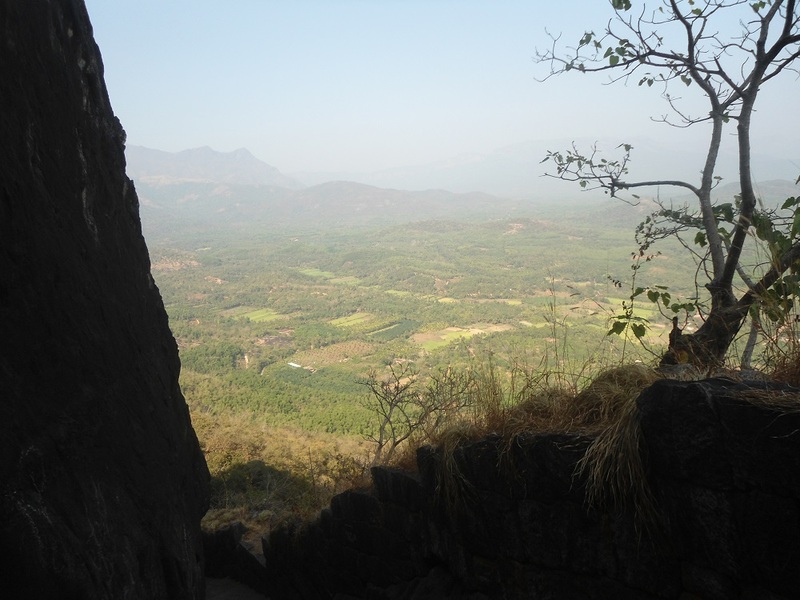 The fort is 1700 ft. above sea level and was formerly called Narasimha Ghada, which refers to the granite hill on which the fort is built. It was built by King Tipu Sultan in 1794 and named after his mother, Jamalabee. 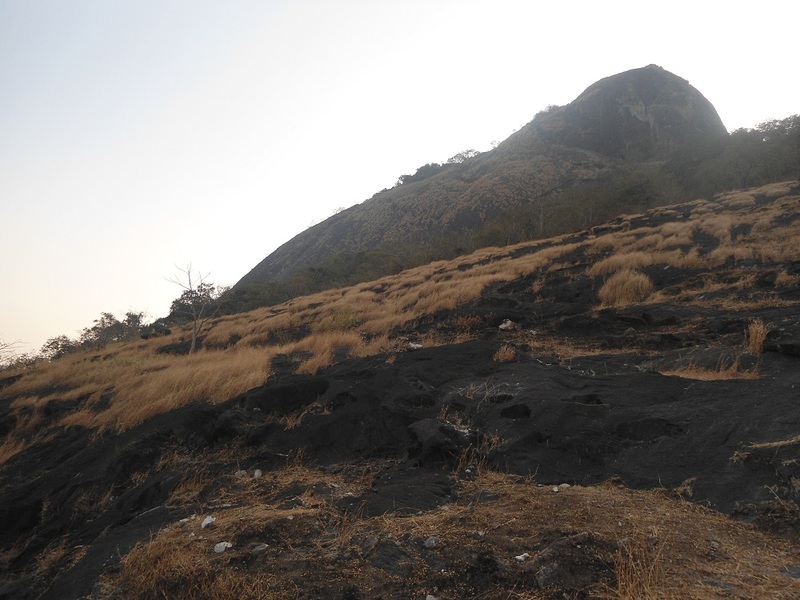 It is inaccessible other than via a narrow path, with around 1876 steps to the fort that are cut out of the granite hill and lead all the way to the top. The fort was captured by the British in 1799 during the 4th Mysore war. 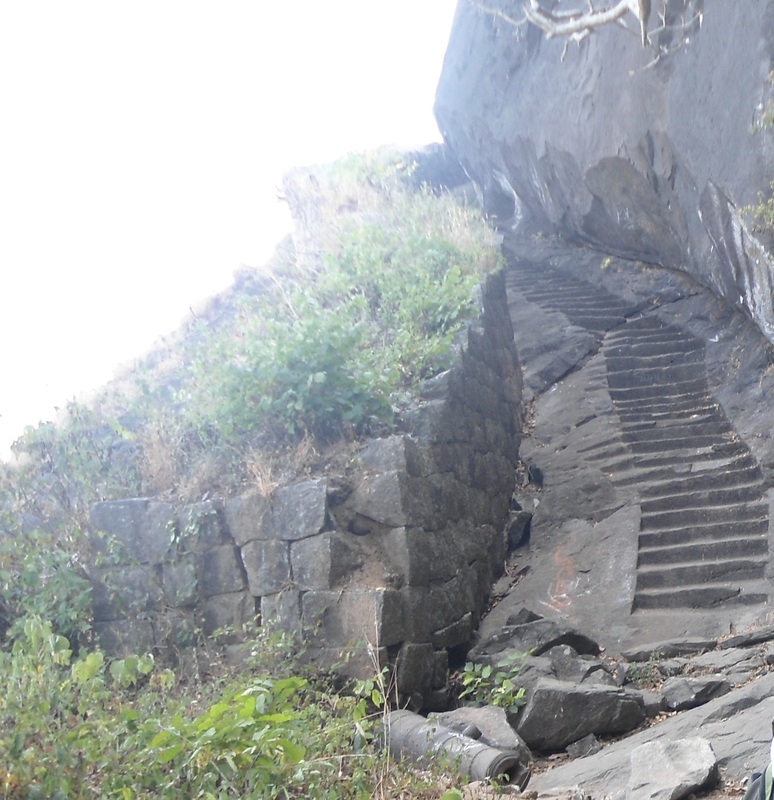 Legend has it that those out of favour with Tipu were hurled down the edge to their death. Alright let me recollect now. It’s been nearly 6 six months to this lazy trip that we undertook. With three other friends of mine, I set off from Mangalore as early as 0500hours to the holy Dharmasthala temple. After going around the temple and visiting the vintage car museum by the shrine, we left for the fort at around noon. Starting our hike towards the peak after obtaining the necessary permits, we realized that the climb was all the more steep and relentless- an initial patch of forests and then the infinite stretch of stairs. All along the way, the views to the east were far reaching. Indeed, lucky that we were, we managed to spot a very rare red-tailed huge squirrel jumping across on our way up. The top of the hill contains sparse remains of the fort and a modern transmission tower. Towards the top, the rocky steps wind and curve around steep rock faces, hugging tightly as if they themselves might fall off and plunge to certain death. There is a rusted canon on the way up. Inside the fort, there is only one tank to store water. Nothing much of the fortifications remain but hints of the fort wall with parapets are visible. Except to the east, there are forests in every other direction. 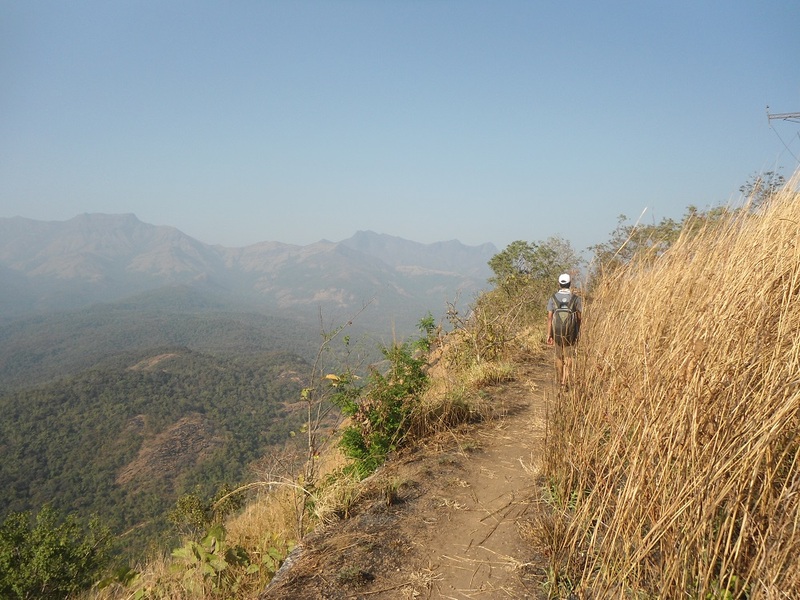 The far ranges of Kudremukh are so clearly visible from the peaks. Taller peaks stood to the north under a brilliant sunshine. East of the hill are some villages, farms, coconut groves and a river that flows by. 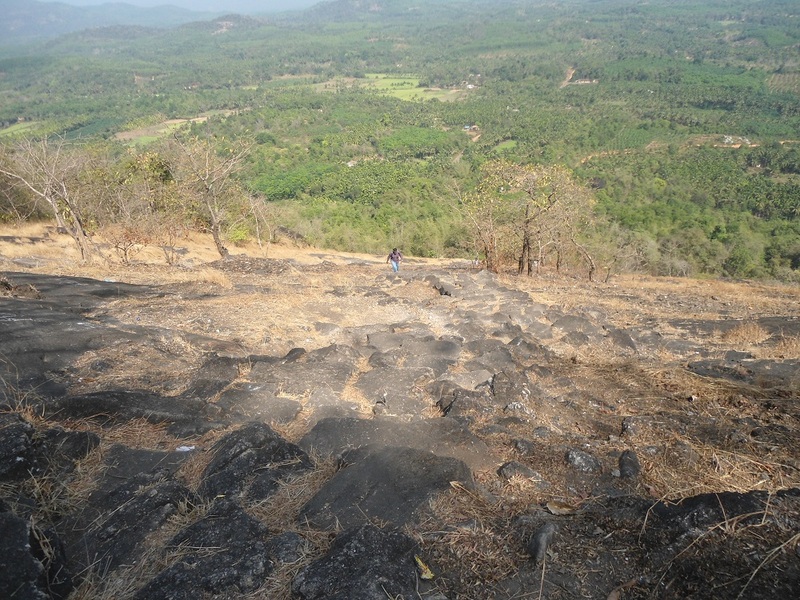 The scene from the top is a mix of green forest cover and patches of brown grass and black rock. It was indeed a nice hike with some friends of mine. Well if you plan on going with a family, just don’t hesitate but remember- while climbing up the flight of steps, just don’t look behind you!